Mary Ellen's Cooking Creations: Heaven in a Wine Store? Saturday afternoon Jon took a trip to a wine store in Stockton, NJ - Phillips Fine Wines. This store is not terribly far from us, but Jon had never been. I recommended he check it out because we love trying new wines, are sick of the selection in the PA state stores, and he wanted to find a nice bottle for our upcoming 5th anniversary. When Jon got home he could barely contain his excitement from being in that store!! He said he was wishing everyone would leave so he could get locked in the place with a corkscrew and a glass! Watching and listening to him tell of his experience that afternoon was so funny! When he first walked in, he thought the front room was the entire store, but then he kept walking and discovered room after room of wines from different regions and countries. But he was still disappointed that he hadn't found any really high-end wines, until he learned of the upstairs room, or as he put it, "the big kids room." I think next time he goes he needs to stay out of that room because it's trouble!! He came home with several new bottles, including a 2004 Opus One that we'll have one our anniversary. On Saturday night we tried 2 of the bottles (yes, 2). 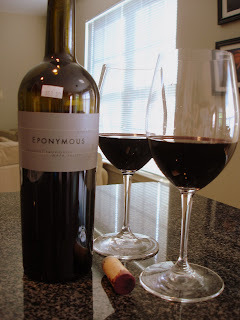 The first was EPONYMOUS, a 2001 Napa Valley Cabernet Sauvignon. Jon described it as inky dark, smooth, with tastes of blackberry and currant. We both agreed that it had to breathe for a while. The longer it was open, the smoother and better it tasted. At $63.50, this is definitely not an everyday bottle for us (oh but it would be so nice if it was...). The second was B.R. 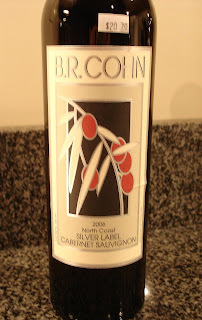 COHN, a 2006 Cabernet Sauvignon from Sonoma. Jon described it as a bit fruity and lighter for a cab. It was just ok, and not worth almost $21. Maybe it was because the first bottle was so good, but I probably wouldn't buy this again. If I did, it may be a good idea to let it sit for a few years before drinking it.